Most of you know by now that I love old postcards. Here is one from from 1918. 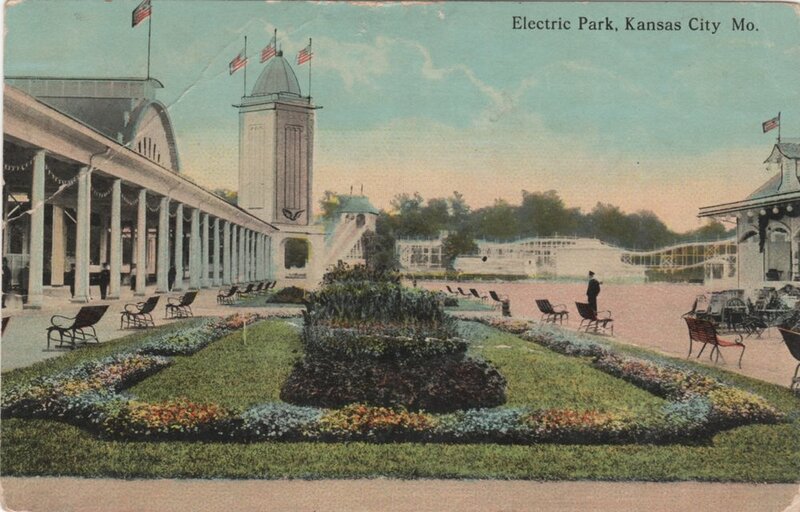 On the front is a colorful summer scene of Electric Park in Kansas City, Missouri, an amusement park operating in that city from 1907-1925. It was sent from Merriam, Kansas on March 31, 1918. It is addressed to a Mrs. Sam Beaty in Peabody, Kansas. Who was Mrs. Sam (Ruth) Beaty? Who is Uncle G and what kind of car did he drive? A fair guess would be that Mabel and Ruth are cousins. What do you think? Who is Ernest? Grandma? Grandpa? What is the history of Electric Park in Kansas City, Missouri? Happy Hunting! Let me know what you find.